Dow Jones Industrial Average News, 5/3/16 – The VIX, commonly referred to as the market's fear gauge, surged more than 9% today (Tuesday) as the Dow tanked over concerns about the health of the global economy. A report showed that manufacturing activity in Chinese factories declined for the 14th consecutive month. The news is certainly unwelcome given that the country has thrown every monetary policy decision at its industries to try to spur economic growth – from currency devaluations to massive quantitative easing programs and more. Of course, none of this is surprising to us. Nations are failing to introduce badly needed structural reforms to liberalize their economies and boost economic growth. The continued reliance on low interest rates and centrally planned spending is creating a global liquidity trap. Here's what else you need to know about the markets on May 3, 2016. First, the good news. April was a good month for auto manufacturers. Domestic sales increased by 5% and put the industry on pace to beat its 2015 record for annual sales this year. But all that cheer didn't do much for company stocks. Shares of Fiat Chrysler Automobiles NV (NYSE: FCAU) fell 3% today despite a 5.6% rise in monthly sales. Meanwhile, shares of General Motors Co. (NYSE: GM) fell by nearly 2% after the firm reported a noticeable sales decline from its fleet division. Ford Motor Co. (NYSE: F) finished the day off 1.4%. Shares of Apple Inc. (Nasdaq: AAPL) were one of the few bright spots in today's trading session. The company gained more than 1.6% as chatter emerged about possible strategies to overcome its struggles in China. Last week, the company reported its worst quarterly earnings report since 2003 and took a public relations hit when activist shareholder Carl Icahn announced that his firm had ditched its sizeable stake in the technology giant. That said, investors shouldn't overthink Apple stock and make the same mistake that Icahn has made. Apple will turn it around, and here's how. But the big news today was WTI crude oil prices, which slipped 2.3% on concerns about a global supply glut. Increased output from the Middle East and the North Sea surprised traders. Reports indicate that Iran has already doubled its daily production to 2 million barrels since Western economies lifted sanctions over the nation's nuclear program. Brent crude oil was off 1.6%. The decline in energy commodity prices dragged down the broader energy sector, which saw its worst one-day performance since March. 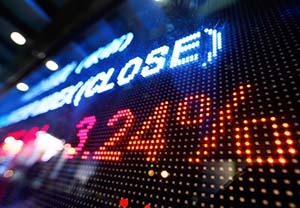 Shares of Exxon Mobil Corp. (NYSE: XOM) and Chevron Corp. (NYSE: CVX) were off 1.5% and 2%, respectively. Hedge fund manager David Einhorn is bullish about a tech company that has seen its stock slide as much as 85% over the last 52 weeks. Shares of Yelp Inc. (Nasdaq: YELP) were up 2.7% today after Einhorn took a stake in the company and said that he sees the potential for 30% upside in the firm. It is a bold move for Einhorn and his hedge fund Greenlight Capital, given that he has been labeled by many as a short-seller and famously predicted the doom of Bear Stearns in 2008. On the earnings front, Anadarko Petroleum (NYSE: APC) saw its stock slide 4.2% after the firm reported lackluster quarterly results. The oil and gas exploration firm fell short on top-line earnings by four cents and missed bottom-line earnings expectations. What could be more fitting for a wild ride on Wall Street than actual roller coasters? Shares of Six Flags Entertainment Co. (NYSE: SIX) fell 1.5% despite news that the company is going to open a new park in the United Arab Emirates in 2019. Investors seemed unimpressed today despite the firm's release of its development plans, which will include several "record-breaking" roller coasters, according to Yahoo! Finance. Shares of Halliburton Co. (NYSE: HAL) cratered nearly 5% ahead of its post-market earnings report. The company is trying to determine ways to boost growth after calling off its planned $28 billion merger with rival Baker Hughes Inc. (NYSE: BHI).